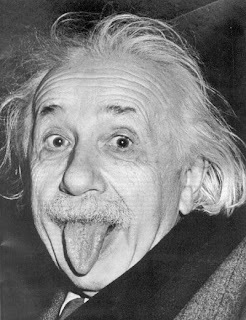 Life With 4 Boys: Maybe Albert Einstein Was a Mother Too? Maybe Albert Einstein Was a Mother Too? A fellow blogger brought up the topic of how often you clean your house on a forum I belong to and it got me to thinking. I for one, clean my house all day every day and it still never really establishes the status of "clean." I mean, it is clean for a home of four boys, but it isn't going to show up in Better Homes and Gardens anytime soon. That got me to thinking, maybe this is why we as mothers are always insane, or at least feel that way a lot of the time. The above referenced quote is from Albert Einstein. Maybe he was a mother too. Think about it, as mothers, we clean the same messes every day, do the same mundane tasks everyday, repeat the same words, phrases and answers every stinking day! We pick the socks up off the floor, put the toilet seat down and go around like a deranged hamster on her little spinney wheel. Do we expect a different result? In my wildest dreams, my children randomly "get a clue" and decide that everyone picking up their own mess really is a simple concept. In reality however, nothing changes and I keep cleaning the same messes and going through the same routine each day. 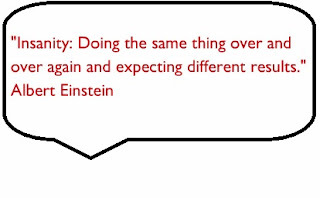 Either Albert Einstein was a mother, or he was studying them when he wrote that quote. At least we all know why we are crazy now! I agree - we just keep spinning our wheels sometimes. Oh lordy. THAT completely explains it. I was just having a minor melt down tonight because I can not keep up with the house work...doesn't help that I work full time outside the home I guess. However, no matter how much work I do it never seems clean. I'm so glad I'm not alone in this housekeeping endeavor. LOL so true! This is me all the way. Amen, Sistah! Einstein had it right thats for sure. Yep! This is why I just need to accept what I cannot change and be thankful for what I have. Hubs will never ever pick up his crap, but hey, he puts the toilet seat down. 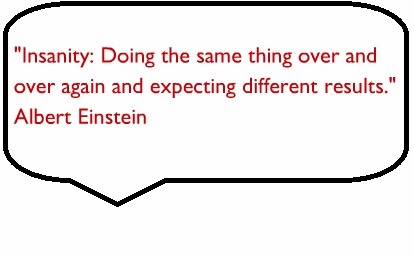 Einstein was definitely onto something.